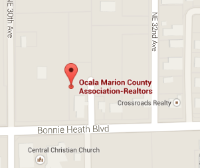 A Realtor® Marketing Session will be held on the first Wednesday of each month at 9:30AM at the Coldwell Banker Riverland Realty office, located at: 11824 N. William St., Dunnellon, FL. This marketing session is open to all Realtor® members, lending Institutions, Title Companies, etc. to pass on any updates or information they may desire.